Welcome to The Gadget Professor Show #356 hosted by Don Baine. The Fuego Professional Grill is based upon the original award winning Fuego Element design with added user friendly features. We started with the base design of the Fuego Element then thought about how to improve your cooking experience. The answers came from vast amounts of customer feedback and market research – the result is our latest model, the Fuego Professional Grill. Combined 26, 500 BTU/hr. 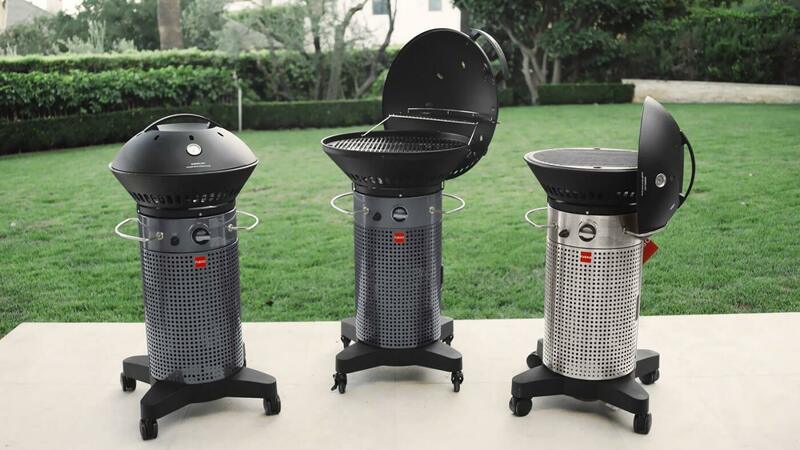 dual zone burner system for direct and indirect grilling reaches 500F in just 5 minutes and 250F-650F overall temps. Featuring perfect clasp door close system, hinged propane tank storage door, non-marking industrial casters and electronic ignition. Speaking of the lid, we added hood hinges at a 45° angle, so no more reaching over the hot fire like most gas grills. The hood also acts nicely as a wind break for those open lid cooking days. Not to mention the 9” of grilling height below is perfect for a beer can chicken or three!!! Offering 415 square inches of primary grilling area with a 110 square inch stainless steel warming rack for a massive combined grilling area of 525 square inches. Large enough for cooking 20 (1/4 lb.) burgers at once. Additionally our heavy duty grate weighs in at over 18 lbs. It provides a massive heat sink ensuring amazing sear marks from any spot on the grill.